Elon Musk shot his own personal Tesla Roadster into space, and it was Good. Wait, no. No it was Not Good. It was a giant ad for a billionaire and his empire and it’s all downhill from here. Or it was inspiring and beautiful. Or it was bad. Welcome to Carguments. This is the first episode of Carguments, a new series for us in which, basically, we turn a camera at ourselves when we’re normally screaming at each other at our desks. My sweet coworker Mike Ballaban argues that because the rocket needed ballast, ballast that was otherwise going to be concrete or sand, sending the car up is just a nice opportunity, something to inspire people, give back some romanticism and allure to space. Is it all moot at this point? Kinda! The car is in space, already officially a celestial object, and it won’t be clogging up our orbit, either. 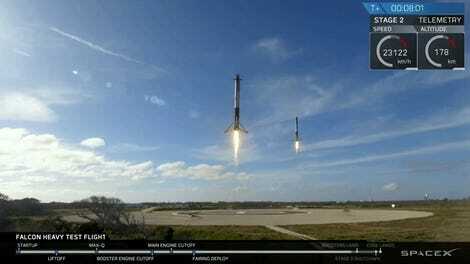 It’s off to go shoot past Mars and deeper into the solar system, thanks to the astronomical thrust of the Falcon Heavy. Both Mike and I are kinda idiots for wasting so much time arguing about this. But which of us is the bigger idiot, and who is right? Watch the video and let us know in the comments. Or Maybe There's A Body Hidden In There????? The Perfect Crime??? ?